Whistler, BC, Canada . 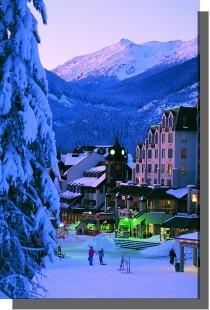 . .
Come join us in the Village of Whistler, British Columbia's Year Round Playground! In the early 1960's Whistler, British Columbia, was first envisioned as a ski resort, and in 1975 it became the first, "Resort Municipality" in Canada. In 2010, Whistler was co-host to the Winter Olympics. 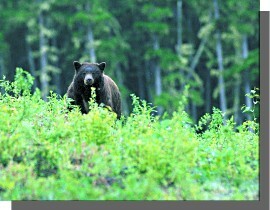 Today, Whistler is an unparalleled year-round destination resort, less than a two-hour drive from Vancouver, BC. Whistler is more than just world-class skiing, it's setting in British Columbia's Coast Mountains offers visitors a wide variety of both winter and summer activities. All year-round, the cosmopolitan Village of Whistler also provides an almost endless choice in dining, shopping and nightlife. Winter in Whistler, with incredible downhill skiing at Whistler and Blackcomb Mountains, is what has made the area world famous. In addition to the downhill ski facilities, winter visitors enjoy cross-country skiing, heli-skiing, ice skating, snowmobiling, sleigh-riding, dog-sledding and a host of other winter recreational pursuits. Summer in Whistler is just as spectacular as winter. Mountaintop sightseeing, world-class golf, mountain biking (Whistler is considered "one of the top bike towns in North America"), hiking, in-line skating, horseback riding, sightseeing, canoeing, kayaking, fishing, and even glacier skiing are but of the few of the opportunities the area provides in the summer months. 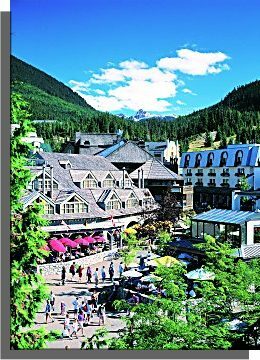 Nestled at the base of Whistler and Blackcomb Mountains is Whistler's award-winning pedestrian village. Designed in distinctive mountain resort architecture, Whistler Village and the adjacent Upper Village are perfectly situated for easy access to both mountains and a huge variety of first class restaurants and distinctive shops. The surrounding valley is sprinkled with parks containing beaches, picnic areas, boat launches and hiking trails. Along the valley there are five lakes, numerous creeks and rivers with kilometers of established trails for hiker, bikers and inline skaters. Whistler Weather: Located in the Coast Mountain range of British Columbia, Whistler/Blackcomb consistently offers the most reliable snow conditions, with an average annual snowfall of 914 cm (30 feet). The average Snowfall at the summit is 9.14 metres (30 feet) per year on summit. Due to Whistler's coastal proximity, temperatures are moderate throughout the winter season, rarely dipping below -10C (12F) in the Valley and -15C (5F) in the alpine during the coldest part of the year. Average daily alpine temperature during most of the winter months, is -5C (22F). During the summer months of July and August, temperatures will reach an average of 27c (80F). Access: Whistler lies 120 km (74 mi.) north from Vancouver or 44 km (27 mi.) north of Squamish on the scenic Highway 99. It is also accessible by bus and train charter air service, taxi, and limousine. 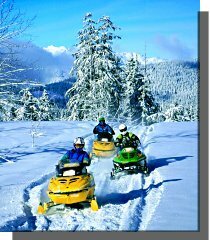 Recreation Facilities & Activities: golf courses, 2 world class ski mountains, downhill ,cross country and heli-skiing skiing, ice skating, snowmobiling, hiking, swimming, fishing, boating, biking; photography, sightseeing, camping. 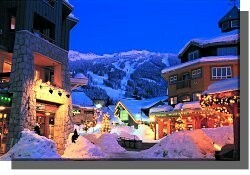 The 2010 Sea to Sky Winter Olympics will see the snow events being held at Whistler. Lift Capacity: 29,895 skiers / snowboarders per hour Terrain Type: 25% expert, 55% intermediate, 20% beginner. Lift Capacity: 29,895 skiers / snowboarders per hour Terrain Type: 30% expert, 55% intermediate, 15% beginner. Services available: The resort community of Whistler offers a complete range of services including banking/foreign exchange and Interac banking machines; church services; medical and dental clinics; physiotherapy and massage therapy; office services; public library; museum; movie theatre and video rentals; health and fitness centres; swimming pool; ice rink; indoor tennis courts; spa facilities and beauty salons.